The Former Hoyts Cinema Centre, comprising the former entrance structure and office tower above, and the former cinema auditoria. The Former Hoyts Cinema Centre was constructed from 1966-69 in the well established entertainment precinct at the east end of Bourke Street. Designed by Sydney architect Peter Muller, it was the first multi-cinema complex in Victoria. The advent of television in Melbourne a decade earlier had seen the demise of the large city theatre and the provision of a facility with three smaller cinemas running simultaneously, a restaurant and associated office tower with rentable space, presented the Hoyts Company with an economically viable option. Established in 1908 as Hoyts Pictures Pty Ltd, this company played a large role in the development of the cinema industry in Victoria, particularly after the introduction of talking films in the late 1920s. Many large, grand theatres were built and well known architects were employed by Hoyts to design their buildings. In reaction to the introduction of television, Hoyts began an expansion, modernisation and replacement programme in the mid-1960s and the largest project was the construction of the $4.5m 13 storey cinema and office tower complex. The genesis for the design by Peter Muller can be seen in a similar project, which remained unbuilt, for Hoyts in Newcastle, NSW in 1960. The originality of the concept and the design ensured that the Cinema Centre received much attention during and after construction, and ultimately led to the closure of the Hoyts -owned Regent Theatre in Collins Street in 1970. 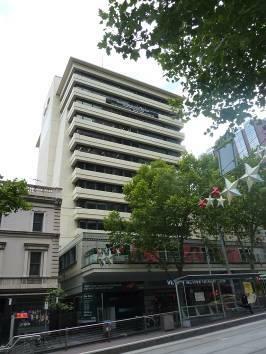 Two floors of the office tower were allocated to the Victorian branch of Twentieth Century Fox Film Corporation (Aust) Pty Ltd and the registered offices of Hoyts Theatres Ltd and the remaining ten floors were made available for rent. In 1982 one of the cinemas was divided into two separate cinemas and in 2005 the Cinema Centre was closed after thirty-five years of operation. In 2009 the lower levels of the complex were converted into a health club resulting in extensive remodelling of the cinemas and their associated foyer spaces. The tower has continued to provide rentable office space. The Former Hoyts Cinema Centre is a carefully detailed building comprising a two-level podium that originally housed the cinemas and associated foyers on split levels, a basement that housed plant, car parking and store rooms, and an office tower that rises above the podium. The cinema auditoria were located at the rear of the site, structurally separate from the remainder of the building. Principally an off-form concrete building, it is highly distinctive, innovative and individualistic in design and clearly draws inspiration from Asia. The symmetrical tower block resembles an inverted pagoda with each rising floor level increasing in size. 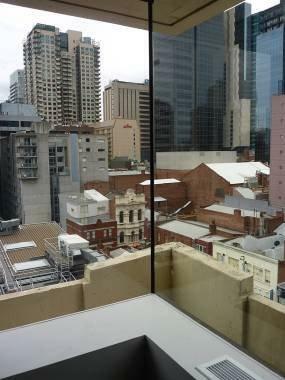 The overhang which resulted provided shading, reduced energy needs and allowed the unusual use of timber window frames in a city office building. Muller's design was based on a structural system which was inspired by oriental post and bracket construction to achieve the stepped form of the tower and this resulted in a distinctive multi-storey building profile in contrast to the commonly used curtain wall or precast panel facades of the 1960s. The tower dominates the exterior form and comprises massive off-form concrete side buttresses, both vertical and tapered in form, which contrast with horizontal concrete balustrading of the front and rear facades. A dramatic fleche, with five encircling rings at its base, crowns the tower. 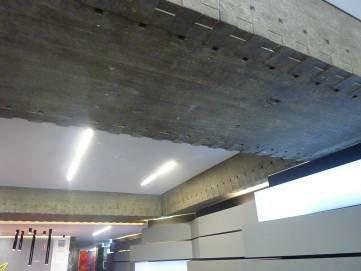 The concrete throughout the building is treated in a highly Brutalist manner with the rough marks of the construction boards remaining clearly evident. Interiors of the public areas were well detailed but little of this remains, with the exception of dentilated concrete beams of the original entrance plaza and lobbies. Muller's early work, including the Cinema Centre, displayed characteristics similar to the work of Frank Lloyd Wright and many architectural critics, both contemporary and more recent, have regarded Muller as amongst the best exponents of Wright's philosophies in Australia. The Former Hoyts Cinema Centre is significant for its associations with well known Australian architect, Peter Muller, who achieved early recognition as a Sydney house designer and whose work embodied organic architecture, in a similar manner to Frank Lloyd Wright. Muller was one of the first Australian architects to embody Japanese ideals, and this oriental influence is evident in his largest commission, the Former Hoyts Cinema Centre. As Executive Director for the purpose of the Heritage Act 1995, I give notice under section 46 that the Victorian Heritage Register is amended by including Heritage Register Number H2335 in the category described as Heritage Place. All of the place shown hatched on Diagram 2335 encompassing Lots 1, 1A, 1B, 2, 2A-2H, 2J, 3-41, 201-204, 301, 302, 401-404, 501, 502, 601, 602, 701, 801-804, 901, 1001, 1101, 1102, CM1-CM9 on Plan of Subdivision 428191 and the awning/balcony to Bourke Street. In the early twentieth century moving pictures were shown in existing halls and theatres in Victoria however by the time 'talking films' were introduced in 1929 a number of specific cinema buildings had been constructed. As picture-going grew in popularity and became a regular form of entertainment, the size of theatres increased and grand picture palaces such as the Capitol (1924), State (1929) and the Regent/Plaza (1929) were built in Melbourne; the latter two being the two largest theatres in Australia when constructed. Built before the depression of the 1930s, these theatres were grandly conceived and richly decorated, ensuring that an excursion to a city cinema was a special occasion. Many city entertainment businesses, including theatres, were established in Bourke Street. The first theatre to be opened in Bourke Street was the Pavilion in 1841 and by the late 1840s the eastern end in particular had developed as the city's principal entertainment zone. This continued in the early twentieth century when theatres and cinemas such as the Britannia (1912-1933); De Luxe (1915-c1975); Empire (1916-1936); Melba (1911-1978); Palace (1914-c1980); Paramount (1915-1974); St George's Hall (1909-1914); Star (1911-1931); and Victoria (1916-1935) were established. The introduction of television in Melbourne in the late 1950s had a profound effect on cinema going. As a result the ownership of large theatres became a liability rather than an asset in the early 1960s and many were demolished, modified or closed. Hoyts' Capitol Theatre in Swanston Street, initially marked for demolition, was only saved by the conversion of the vast space into a smaller theatre and shopping arcade. In a similar way, Greater Union's State Theatre at the corner of Flinders and Russell Streets was converted into two smaller theatres in 1962: the Forum and Rapallo, while Hoyts' Regent and Plaza Theatres were closed in the late 1960s. The Plaza was converted to a shopping arcade while the Regent was marked for demolition, but eventually saved after remaining closed for a number of years. However a substantial number of city cinemas survived the introduction of television and in 1966 Sands and McDougall Directories listed a large number of city film venues. In Bourke Street, east of Swanston Street, alone the following were listed: New Metro Picture Theatre, Embassy Theatre, My Fair Lady Theatre, Hoyts' Esquire Picture Theatre, Paris Theatre, Tivoli Theatre, Times Theatrette and the Odeon Picture Theatre. That same year the large multi-cinema complex was introduced to Melbourne with the construction of the first three cinema complex, the Hoyts Cinema Centre in Bourke Street, and this trend has continued into the twenty first century. The Hoyts Company played a large role in the development of the cinema industry throughout Victoria. The company began in 1908 when dentist, Arthur Russell, leased St George's Hall, on the north side of Bourke Street just east of Swanston Street, to show pictures. He formed a company which he called Hoyts Pictures Pty Ltd and rebuilt the theatre as the Hoyts De Luxe in 1915. By the early 1920s the company had expanded into the Melbourne suburbs and Sydney, and in 1926 Hoyts Pictures merged with another company, Electric Theatres Pty Ltd, to form Hoyts Theatres Ltd, under managing director Frank Thring. The construction of Regent Theatres in major Australian cities followed in 1928-29. Through the 20th century the Hoyts Company employed a range of well known architects to design their cinemas to ensure that interesting buildings were produced to enhance the cinema experience. These included William Pitt, Cedric Ballantyne, Charles Bohringer, Neville Hollinshed, H V Taylor and Cowper, Murphy & Associates. Despite the introduction of television in 1957, Hoyts began a large expansion, modernisation and replacement programme in 1964 and Sydney architect Peter Muller was employed to design the largest of these. This was the $4.5m 13 storey cinema and office tower complex of 1966-69 which incorporated three cinemas. The construction of four new picture theatres in Melbourne in the 18 months leading up to the opening of the Cinema Centre, indicated a revitalisation of the industry in Australia in the mid-1960s and Hoyts alone occupied five city theatres in 1966. The Cinema Centre itself was described at the time as a 'revitalisation not seen in this country since the advent of 'talkies'', which was some forty years earlier. It was the first major excursion into cinema construction in Australia after World War II. Representing an entirely new concept in cinema design in 1966, the building was claimed to be only the third in the world to contain three cinemas in one building, the others being in New York and Toronto, Canada, and was the first of its kind in Victoria. The opening of the Cinema Centre in Bourke Street ultimately led to the closure of the Regent Theatre in Collins Street in 1970 and that same year Hoyts opened two new cinemas in a complex known as the Mid-City Cinemas at 200 Bourke Street. A reaction to the abstraction and apparent simplicity of International Modernism emerged in the post-war period, with architects exploring alternative modes. In Australia architects in the early 1960s explored the humanist works of Frank Lloyd Wright and the ideas of Brutalism in different ways. 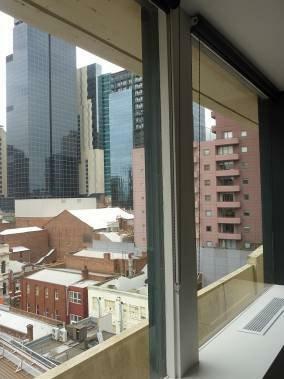 From the early 1960s there was a change in aesthetic preferences, and the slick glass curtain walled buildings of the 1950s, such as the former ICI House at 1 Nicholson Street, East Melbourne by Bates Smart & McCutcheon (1955-58, VHR H786), lost favour. Concrete became the favoured material and the skeletal appearance of 1950s buildings began to give way to solid more modelled forms. 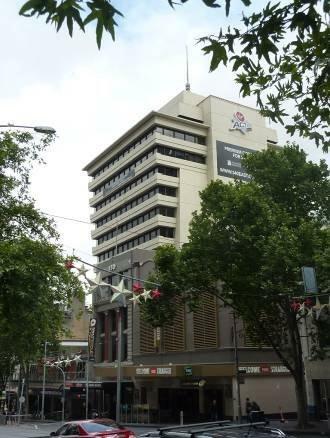 This can be seen in a number of city office buildings including the Former BP House (1962-64), Victorian State Offices (1962-68, VHR H1526), National Mutual Life Centre (1965), Former BHP House (1969-72, VHR H1699) and Eagle House (1970-1-71, VHR H1807). The uniformity of pre-war Modernism was challenged in the 1950s by New Brutalism, a term coined by London architects Peter and Alison Smithson. Built on the work of modern architecture pioneer Le Corbusier, and largely inspired by his design for the Unite d'Habitation in Marseilles (1952), this robust architecture became widely accepted around the world. Brutalism incorporated ideas of integrity in expression of materials (especially brick and off-form concrete), structure and function, and often gave rise to dramatic sculptural forms. The term is also closely associated with Le Corbusier's beton brut, or concrete in the raw, where the natural state of the material remains when the formwork is removed. The imprint of the construction boards in the final finish was considered an honest use of such a material. Although the movement was originally European the influence in Australia came more from built works in North America and Japan. The Brutalist movement dominated construction in post-war Japan and the new western thinking led to such innovative architectural designs as the Hiroshima Peace Centre, designed in the 1950s by Kenzo Tange, and combining the Le Corbusier style of modernist architecture with the forms of the traditional tombs of the rulers of old Japan. Kenzo Tange's mature works are built of concrete left as rough as possible and used for dramatic effect. From the 1950s western architects began to realise that traditional Japanese construction had the simplicity, lightness and openness that western architects had been advocating, and began to take an interest in the work of contemporary Japanese architects. The architect and critic Robin Boyd became fascinated by Japanese architecture in the 1960s and was an advocate for an appreciation of the striking concrete buildings of post-war Japan. In 1962 he published a book on the work of Kenzo Tange (and in 1968 New Directions in Japanese Architecture). Tange's later works, such as the Kagawa prefectural office (1955-58), are notable for restraint of design and the employment of the traditional Japanese aesthetic in modern technical terms. In the early 1960s in Australia architects tended to draw primarily on the visual attributes of Brutalism. Evidence of the style was at first mainly found in brick buildings (for example the so-called 'Sydney School' houses). Concrete was used but not yet in the form of the beton brut with the dramatic forms that characterised much Japanese, European and American architecture of the 1950s. The first example of the use of beton brut in Australia was at the Hale School Memorial Hall in Perth by Marshall Clifton with Anthony Brand, completed in 1961, which displayed a strong Japanese influence. In Melbourne among the earliest and most well-known Brutalist buildings are the Plumbers and Gas Fitters Union Building by Graeme Gunn (1967-71, VHR H2307) and the 1969-79 work from the office of Daryl Jackson, such as Harold Holt Swim Centre by Kevin Borland and Daryl Jackson (1969, VHR H69). Sydney architect Peter Muller completed a mix of domestic and commercial work, particularly in the years from 1952 to 1972. He achieved recognition early as a house designer with a flair for reinterpreting the organic architecture of Frank Lloyd Wright and he was one of the first Sydney architects to embody Japanese ideals in his work. In his work he strove for harmony between people and nature, a balance and integration between a building and its site, and applied organic principles to Australian sites by using local materials. Muller's acceptance of the philosophy of the East and empathy with the eastern-influenced ideas of Wright, influenced his work. A romantic movement evolved amongst Sydney architects and presented an alternative to the rational, and somewhat impersonal, approach of the International style of the 1950s and 1960s. Peter Muller was born in Adelaide in 1927 and graduated in architecture from the University of Adelaide after only four years of study in 1948. The following year he became a registered architect and moved to Sydney where he worked with the architects Hennessy & Hennessy. As the first Australian graduate architect to be awarded the Fulbright Scholarship for study in the United States in 1950, Muller completed a masters degree at the University of Pennsylvania the following year. Muller returned to Sydney in 1952, opposed to the international nature of modernism and as a proponent of the intrinsic nature of natural materials, and was introduced to the philosophy and work of Frank Lloyd Wright by fellow architect, Adrian Snodgrass. His reinterpretation of Wright's organic architecture was seen immediately when he established an independent architectural practice called 'The Office of Peter Muller' in 1953 and began to design buildings which were predominantly domestic in nature. Muller's work responded clearly to each individual natural setting, employed natural materials, including timber, brick, stone, concrete and copper and avoided synthetic materials. A strong sense of both geometry and axial composition can be seen in his work, with the repetition of simple geometric elements used to unify the form. Muller developed an independent approach to his work, developing an organic ideal appropriate to the Australian context, and throughout the 1950s and 1960s his impact on domestic architecture, particularly in the Sydney region, was significant. He was one of the first architects to be working in what became described as a 'Sydney School' movement, comprising architects who drew inspiration from different sources but had similar ideas on the use of sympathetic materials, economy, simplicity and an appreciation of nature. Sources included the organic work of Frank Lloyd Wright, traditional Japanese architecture, Scandinavian architecture and Brutalism. Muller embodied Japanese ideals in his work and visits to Japan in 1961, 1963 and 1966 appear to have influenced Muller's architectural work, both domestic and commercial. In addition to his domestic work, Muller designed commercial projects including the IPEC headquarters in Adelaide (1965) and completed a number of projects for Hoyts Theatres from the early 1960s, including the Hoyts Cinema Centre, Bourke Street, Melbourne (1966-69). According to Philip Goad, this was his largest commission in Australia. Muller's trip in 1966 was reportedly extensive with the purpose being to study the latest developments in motion picture theatre and office building design. It included visits to the United States, London, Rome and Tokyo. From the 1970s to the 1990s, Muller furthered his interest in Asian culture, architecture and crafts with the design of resort hotels in Bali. Designed using local materials and building techniques and built by local craftsmen and artisans, these designs contrasted greatly with many of the international hotels being built there. Projects included the Oberoi Bali (1977) and the Amandari Hotel, Bali (1989). Muller was the chairman of the National Capital Development Commission from 1975 to 1977. His work focussed on the design and planning of the National Triangle and included the establishment of functional criteria for the new parliament house. Peter Muller's contribution to Australian architecture was well noted in publications in the 1950s and 1960s, and in more recent times in publications such as the international book, M Emanuel (ed), Contemporary Architects, 1994 in which Philip Drew contributes an entry on his work. Melbourne architectural historians such as Philip Goad and Miles Lewis have also acknowledged the quality of his work in various publications. The Hoyts Cinema Centre was constructed on a site on the north side of Bourke Street between Russell and Exhibition Streets in 1966-69. In the 1880s the site was occupied by two buildings containing a hotel, tea rooms, and number of small businesses. MMBW plans from 1895 indicate that the eastern half of the Bourke Street site was formerly occupied by the Redleap Hotel. Draper John Payne ran a business in this vicinity from c1886 and Payne's Bon Marche store was erected on the site in c1909, to designs by Melbourne architects H W & F B Tompkins. A photograph of this store indicates that it was an asymmetrically designed building with mansard tower to the west and showroom entrance to the east. It would appear that this building was modified before being demolished in 1965 for construction of the Hoyts Cinema Centre. The Hoyts Cinema Centre was designed in 1966 by Sydney architect Peter Muller and was completed and opened in 1969. Bernard Evans & Partners were the supervising architects and construction was by Prentice Builders Pty Ltd. Muller had been engaged by Hoyts to design a new development in Newcastle, NSW, in c1960. The proposed development of a Council-owned site included an office tower block, shopping arcade and cinema however the development did not proceed and Muller used the basis of this design for the Hoyts Cinema Centre in Melbourne. Muller's plan included an entrance lobby, three cinemas with separate foyers, a restaurant and ten storeys of office space for letting and two floors to house the Victorian branch of Twentieth Century Fox Film Corporation (Aust) Pty Ltd and the registered offices of Hoyts Theatres Ltd. The project cost $4.5m to construct. Economic considerations demanded full use of the site and the inclusion of office space for rental made good use of valuable and costly space. Car parking was provided in the basement of the building. The complex was designed with three cinemas and a restaurant to be accessible by the general public and an office tower with ten rentable floors which was to function independently. 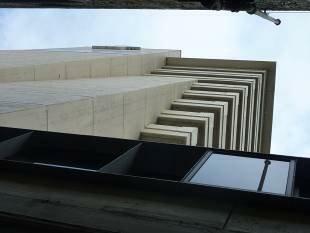 The cinemas were located to the rear of the complex and the office tower rose above the front foyer spaces. Functioning simultaneously, cinemas one, two and three were designed to hold 884, 820 and 746 patrons respectively and circulation was of prime importance to the working of the complex. A large entrance lobby, with a large Jarrah chandelier, was surrounded on three sides by the first floor restaurant. Split levels, separate foyers and distinctive interiors provided the three cinemas with their own identity. The office tower was designed with a separate entry via a dual purpose plaza which also provided access to the cinema lobby. The exterior and interior of the building was distinguished by its finely detailed, off-form concrete and rough board-marked concrete and the interior was distinguished further by fine natural timber detailing and brick finishes. 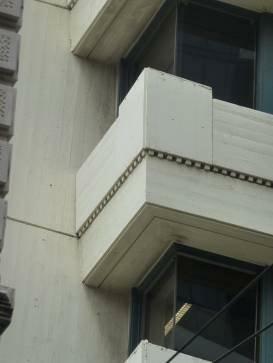 Unlike theatres of an earlier era, the building was devoid of excessive elaboration; instead simple finishes and detailing were used to highlight the materials employed. This included dentilated detailing on the soffit of concrete beams in the original entrance plaza and across the facade and beautifully detailed timber ceilings and chandelier. All concrete was unpainted and the rough board marks of the off-form concrete were proudly displayed. The tower was designed with an outward taper to the top which allowed for shading and the use of timber window frames. Cinema three was the only original cinema to be constructed on two levels and in 1982 it was divided into two separate cinemas. 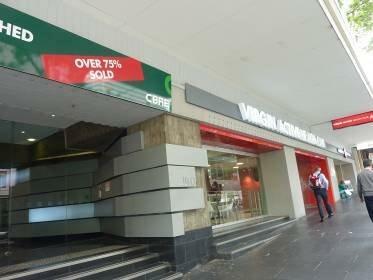 In 2005 the Cinema Centre was closed by Hoyts and in 2009 the cinema complex was transformed into a city health club. This required extensive remodelling of the cinemas and their associated foyer spaces. The tower has continued to provide rentable office space. Designed by Peter Muller, this cinema centre and office tower was built in 1966-69 as the first multi-cinema complex in Victoria. It reflects the revitalisation of the cinema industry and is a highly innovative modernist design from the period. All works should be informed by a Conservation Management Plan prepared for the place.
. Internal works to all parts of the registered place known as the Former Hoyts Cinema Centre, excluding the internal structure required to support the building. The extent of registration of the Former Hoyts Cinema Centre on the Victorian Heritage Register affects the whole place shown on Diagram 2335 including the land and the building. Note that the interiors are exempt from the permit requirements of the Heritage Act 1995 (see "Permit Exemptions"). Under the Heritage Act 1995 ('the Act') a person must not remove or demolish, damage or despoil, develop or alter or excavate, relocate or disturb the position of any part of a registered place or object without approval. It is acknowledged, however, that alterations and other works may be required to keep places in good repair and adapt them for use into the future. Permits are required for anything which alters the place or object, unless a permit exemption is granted. Permit exemptions usually cover routine maintenance and upkeep issues faced by owners as well as minor works. They may include appropriate works that are specified in a conservation management plan. Permit exemptions can be granted at the time of registration (under s.42 of the Act) or after registration (under s.66 of the Act). It should be noted that the addition of new features or structures to the registered place, as well as alterations to the exterior of the existing building requires a permit, unless a specific permit exemption is granted. Interior works to the existing building are permit exempt. The retention of the remaining unpainted dentilated concrete beams in the original entrance plaza and lobbies of the building is encouraged. The cultural heritage significance of the Former Hoyts Cinema Centre lies in its highly distinctive and individualistic architectural character which exhibits both oriental and Brutalist qualities. The building also has important associations with the development of the cinema industry due to its introduction of the multi-cinema complex to Victoria and the incorporation of a rentable office tower to maximise the use of valuable space. 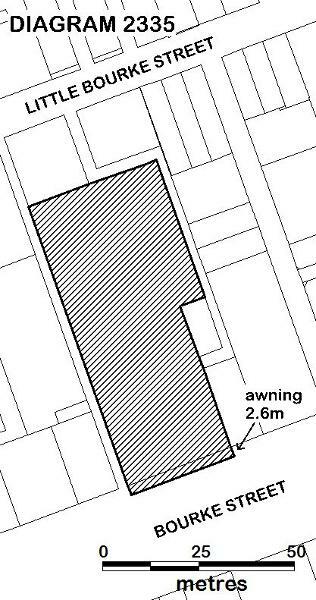 a) The elements of the building listed here are of primary cultural heritage significance in the context of the place. A permit is required for works or alterations.
. Exteriors of the entrance structure of the building and the tower, including the mezzanine level and awning. b) The elements of the building listed here are deemed to have contributory cultural heritage significance to the place. A permit is required for works or alterations. It is acknowledged that there is scope for some modification of this element, subject to the permit process.